In the last lesson I wrote about light barrier. Sometimes there are sensors which are more adequate than a light barrier f.ex. if you want to photography a bursting balloon. In this lesson I’ll show how to use a sound trigger. As we saw in the last lesson in most cases there is not a correct or a wrong trigger. One can solve a problem with different approaches and finally its the decision of the photographer, which trigger he chooses. In highspeed photography sound trigger and light barrier are often used. For this reason, I’d like to have a look at both triggers. If you understand the principle then you should be able to use other triggers. The basic Arduino setup is the same as in lesson 6 but this time we’ll connect a sound trigger. As in lesson 7 the sound trigger is from hiviz.com (about 20$). Again we connect the output of the sound trigger with an analog input of the Arduino. With the hiviz.com sound triggers the output is on the anode of the SCR. (Until version 10: Row 16 F-J, version 10: Row 9 A-E). 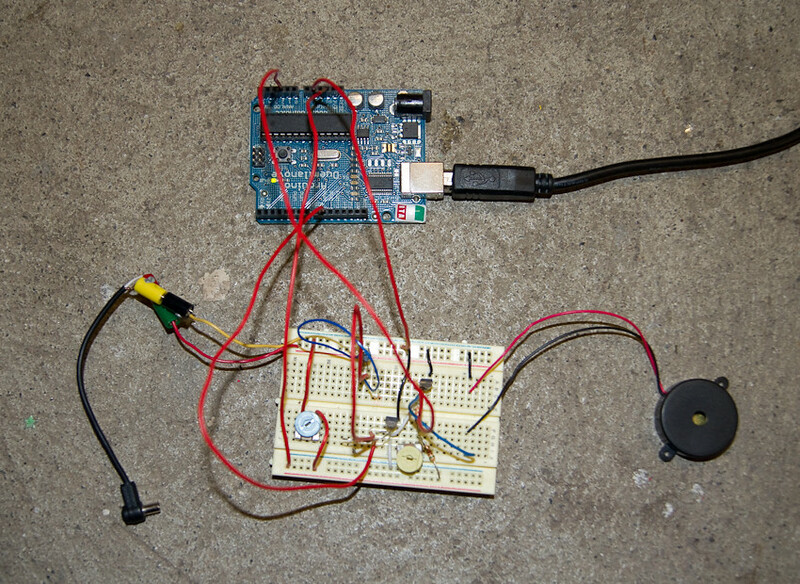 We’ll setup the Arduino to trigger the flash as soon as there is a signal from the sound trigger. (The code is the same as in lesson 7). One of the advantages of the sound trigger is that you don’t have to put it a bit further away from the object. Especially if you’re dealing with liquids you can prevent the electronics from getting wet. I described the process of taking the pictures already multiple times: Turn of the light, start the cam, break glass / burst balloon…, flash, cleaning. As we see the difference between the light barrier and the sound trigger is minimal. You should be able to connet other sensors like accelerometer based on the information from the last two lessons. This is the last lesson of the highspeed photography 101. I’d like to retrospect and show what my basic considerations are when I take a highspeed photo. Lesson 1-3: Describing some basic techniques of highspeed photography. At the start of a highspeed photo I think about which of theses techniques to choose. Lesson 4: Basic knowledge of the Arduino. Lesson 5-8 will use this knowledge. Lesson 5/6: Depending on the chosen technique I decide whether to trigger the camera or a flash. Lesson 7/8: Depending on the situation I decide to use sensors. In those two lessons I wrote about light barrier and sound trigger, but you should be able to use any sensor based on that information. If there are questions or if you need help with your highspeed photos, you can always contact me. and special thanks to you, the reader of those tutorials. Thanks for the series of lessons. Incredibly detailed and an excellent resource. It has opened up a new area for me, and I will be now pursuing. Hoffe dass ich nun mehr Zeit habe um neue Bilder zu machen..
Great series has really inspired me to attempt highspeed photography. Looking at your setup of hiviz and ardunio has confused me some. Your hiviz breadboard looks a bit different then my (sound trigger) one, I was wondering what modifications you made to yours to in order to get to the final setup. Any information would be greatly appreciated! vielen Dank für dieses hervorragende Tutorial. Tolle Anregungen, tolle Ideen und tolle Bilder. Hi! Nochmal vielen Dank für die Tutorials! Haben mir einige neue Möglichkeiten in der Fotografie eröffnet! Verwende die Technik schon lange für Langzeitbelichtungen in der Nacht draußen. Laufe dann rum und beleuchte die Gebäude/Bäume im Vordergrund aus aber wäre nie auf die Idee gekommen das man damit auch Highspeed Aufnahmen machen kann. You made some really nice tutorials. I especially love the image in the light barrier tutorial. I’m gonna put a link to this in my blogroll! Hallo, und erst schönen Dank das man da mal was in deutsch nachlesen kann. Vieles gibt es da ja leider nur in Englisch. Da sind ein paar echt schöne Bilder dabei von den bewegten Flüssigkeiten und die Crashszenen mit den Gläsern. Da ich auch gerade mit dem Arduino beginne finde ich dieses Tutorial sehr hilfreich. Da schaue ich bestimmt immer wieder mal rein.